Dill Pickles are a favorite in our household, but I always liked Bread and Butter pickles. Below are a variety of different dill pickle recipes found in my old recipe books, and some that were shared from family and friends, ranging from real simple, to more sophisticated. 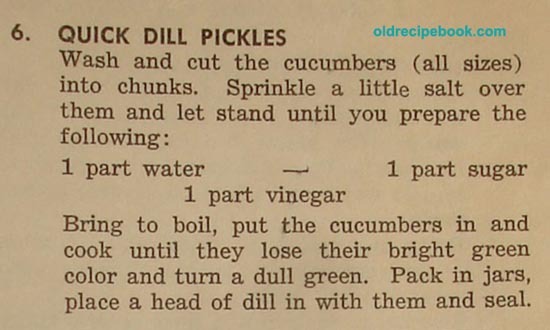 You'll find mostly vintage recipes for making Dill Pickles. If you are short on time, the easiest, hassle-free way to can dill pickles is to make Russian Salt Pickles! 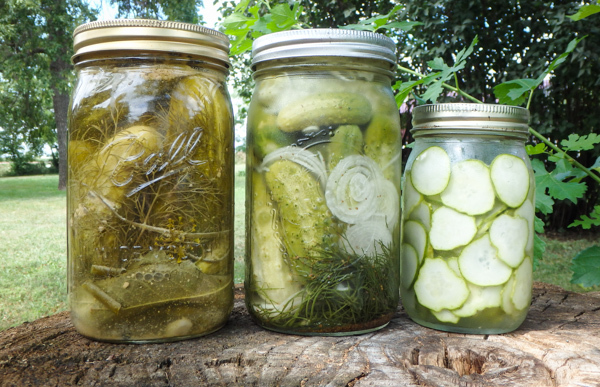 Crisp Pickles: The theory seems to be that if you want crisp dill pickles, you have 3 choices. 1. You can add a tiny bit of alum to your brine. 2. You can add grape leaves. 3. You can soak the cukes in ice water for at least 3 hrs before canning them. Sometimes I keep a bowl of water in the fridge, and as the cucumbers get pulled off the vine, I add them to the bowl. Then when I have enough, I make the pickles. If alum is not available, or you would prefer not to use it, back in the day, they soaked their cucumbers in an aluminum pot to get the same effect. Also, depending on the pan that you use, you can have an entirely different taste. So, a little experimenting could lead to some interesting results. Wooden barrels are still used in some parts of the world. Buy a Mandoline: I was given a gift of a Benriner Japanese Mandoline Slicer. And all I can say is, if you have not discovered the joys of Mandoline use, you just need to go out an get one. It makes slicing cucumbers so much easier and faster, and they are perfect slices every time. You can even slice onions so thin, they're practically transparent. Stuff cukes in jar and add 2 tsp dill to each jar. Heat ingredients to boiling, pour over pickles, wait till cool, put on lids. My Note: This recipe is from my mother's friend. Which in my mother's opinion is the best Dill Pickles. Wash and dry cucumbers. Combine sugar, salt, vinegar, water. Tie spices in cheesecloth bag. Add to mixture and simmer 15 min. Pack cucumbers in hot, sterilized jars. Pour in mixture leaving 1/4 head. Adjust lids and bands. Process in boiling water bath 15 min. Yield 7 pints. It's nice to have enough dill in your garden when the time comes to pickle your cucumbers. It is real easy to grow and makes the garden smell so good. 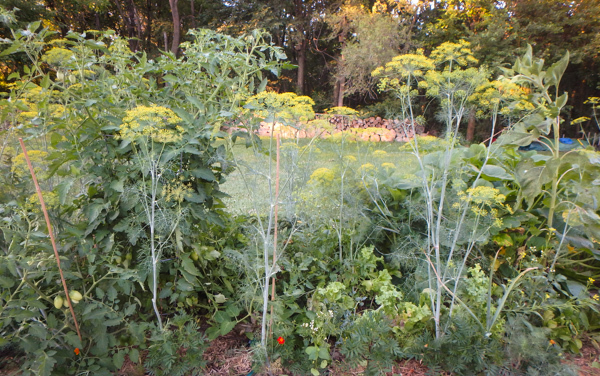 Dill greens are also popular to use in salads and soups. We even get enough to share with our neighbors. 1. Start with clean, hot quart jars. 3. Pack in 1 piece of dill, then pickles, then add 1 clove garlic, another head of dill, 1 hot red pepper and about a 1/4" slice of Jalepeno pepper. 4. 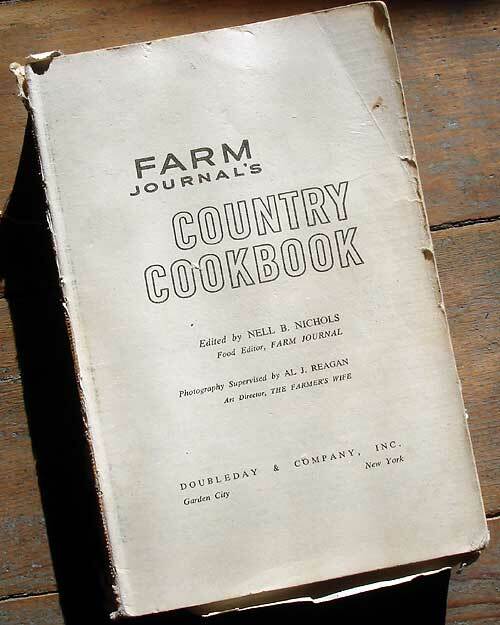 Combine in a large pan: 1 cup granulated pickling salt, 3 quarts water, and 1 quart cider vinegar. Bring to a boil. 5. Fill jars to within 1/2" of top with boiling mixture. Adjust lids (finger tight, not super tight) Process in boiling water bath for 20 min. Start timing as soon as jars are lowered into the water and don't let it go over 20 min, or the pickles will be too soft. Makes about 5 quarts. Pour over pickles. Process 5 minutes in boiling water bath. Pick the cucumbers while they are small for pickling. 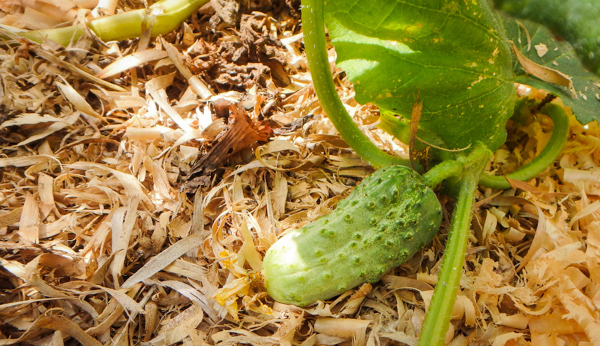 Also adding a layer of wood chips or shavings keeps the cucumbers clean, preserves moisture in the soil, and controls the weeds. Bring to a boil and pour into jars of cucumbers with dill and garlic. Cucumbers should be small, about 3 to 4 inches. Seal and put in warm place until pickles work. Note: Use 2 or 3 heads of dill and 3 cloves of garlic, but make according to how strong you like them. Line bottoms of 2 qt. (or 4 pint) jars with grape leaves. Halve cucumbers lengthwise, then use to fill jars. To each jar, add half of dill, horseradish, mustard seed and onion slices. Boil water, vinegar and salt together. Pour hot over cucumbers in jars; seal at once. Do not open for at least 2 weeks so flavor has a chance to develop. Makes 2 quarts or 4 pints. This is what the dill head looks like. It flowers, and then turns to seed. 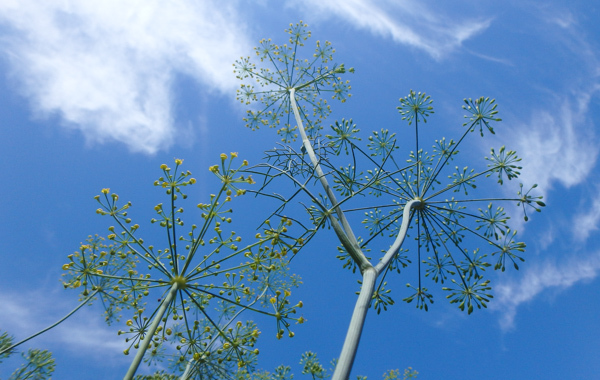 The dill reseeds itself in our garden and comes up voluntarily, and since you don't replant it, it becomes more drought resistant. Dill seeds can also be collected and used in other recipes as a spice. Bring to a boil and pour over cucumbers boiling hot and seal. Wash pickles and slice, then put in cans. Pour boiling syrup over pickles. Seal and cold pack for 5 min. Add dill and some onions to each jar; slice pickles, add juice and seal. 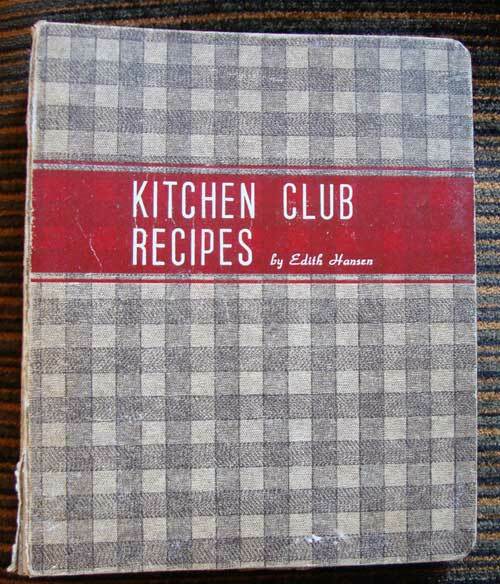 Pictures of recipes in an old binder folder called "Kitchen Club Recipes." 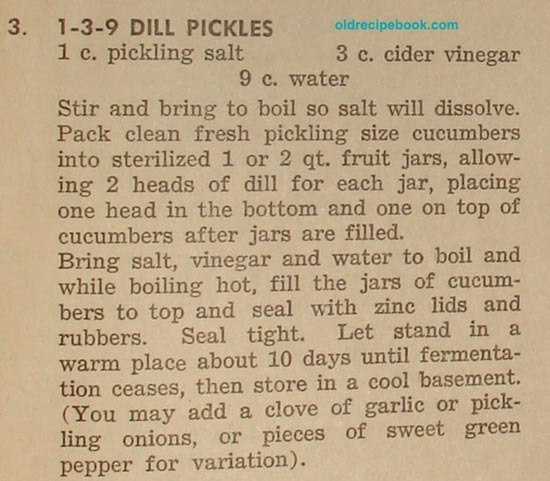 1-3-9 Dill Pickles - This is an interesting recipe that says to fill the jars, put the lids on, and after 10 days, store in the basement. Dill Pickles without Vinegar - Use any size cucumbers. Put dill in the bottom of the jars; fill up with cucumbers and then put in 2 level T. of salt, a small piece of garlic and pickling spice. Put more dill on the top and fill the jars with cold water and seal. Kosher Dill Pickles - This recipe is for a 2 quart jar. 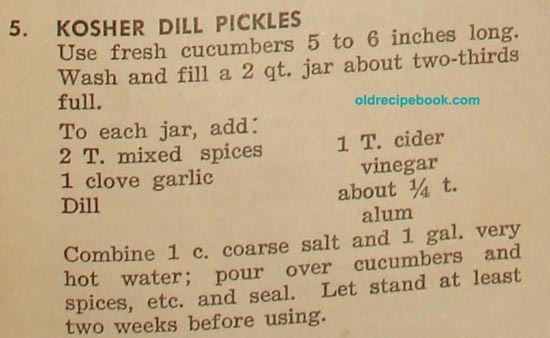 Quick Dill Pickles - For this recipe, cut your big cucumbers into chunks.